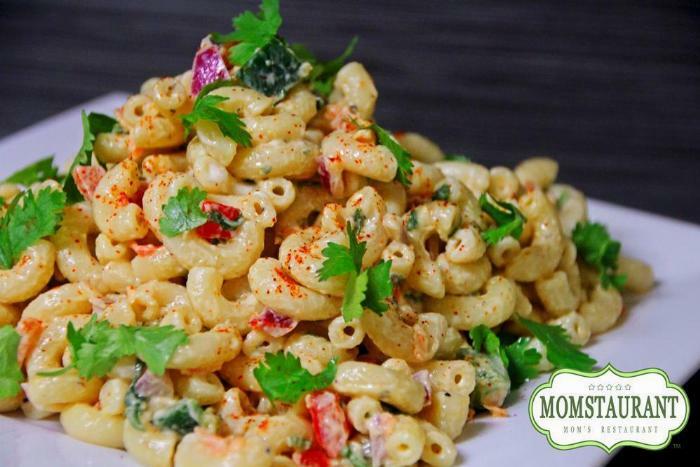 This is my take on the classic macaroni salad, but not as wet as sold in stores, which is a turn off to me. 2Place 1 Poblano and the Serrano peppers on baking sheet and broil until the skin starts to blister and turn black. 3Be sure to turn the peppers to roast all side. 4Once all sides are blistered and black, removed peppers and place in a Ziploc back. Seal close, and cover with a damp towel for 5 minutes. This will allow the peppers to sweat so that the skins will slide off. 5Meanwhile, cook you macaroni noodles as directed on the box. 6While the noodles are cooking in a large mixing bowl add mayo, lime juice, salt, black pepper, cayenne pepper, and sugar. Mix well. 7Then return back to your roasted peppers and carefully peel the skins off, slice in halves, and remove all seed. You can use you knife to scrape out the seeds or you can rinse the seeds. 8Chop roasted peppers and the other half of the raw Poblano pepper and add to mixing bowl with chopped red onions, red bell peppers, cilantro, and grated carrots. 9Mix well until all combined, then refrigerate. 10By this time the noodles should be done cooking. You want to make sure they are cooked all the way through. I boiled mine for 10 minutes. 11Drain noodles, place back in pot and stir, do not rinse! Rinsing the noodles will remove the starch which is needed for the sauce to stick. 12Stir pasta noodles for 5 minutes until pasta becomes sticky. This will help to cool the noodles off while activating the starch, thus making it sticky so the sauce can stick. 13Once the noodles are completely cooled, and them to the mixing bowl with sauce and stir until sauce is evenly dispersed on the noodles. 14Cover pasta tightly with saran wrap and refrigerate for 4 hour to overnight for best result. 15Before serving, to liven the pasta up, add 1 tbsp of mayo, a squeeze of a little lime juice, and some chopped fresh cilantro. So as always, give this recipe a try, and let me know how you like it!